On the Rebuild America Defeat Obama national bus tour, we finale every rally with "God Bless the USA." As the song is sung, vets in the audience are invited on stage. At our rally in Saint Clair Shores, MI, a very frail bent-over gentleman, overflowing with dignity, slowly and methodically began making his way to the stage, assisted by his daughter. 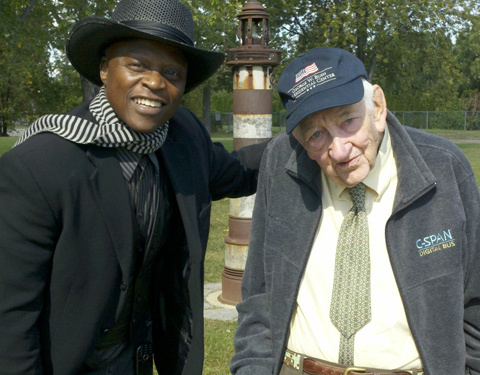 The old soldier was 92 year old WW II vet, Mr. Roher. Talk about an amazing moment, there was hardly a dry eye in the audience. Though unspoken, somehow Mr. Roher epitomized the pride, dignity and greatness of America. The Left relentlessly attempts to brand the Tea Party haters. We are NOT about hate. Quite the opposite. The Tea Party is about love — love for the greatest nation on the planet and a deep desire to restore and preserve it. A member of our team said Mr. Roher's daughter said she believes her dad is holding on to life until after the election.